یوسف زاده چابک, معصومه, باقری, علی, داوری, کامران. (1395). ارزیایی سیستم منابع آب با رویکرد یکپارچه بر اساس چارچوب حسابداری آب در محدوده مطالعاتی مشهد. 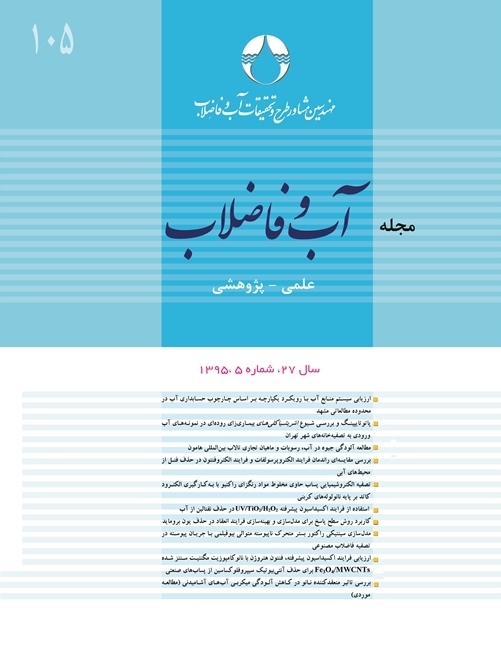 مجله آب و فاضلاب, 27(5), 3-16. معصومه یوسف زاده چابک; علی باقری; کامران داوری. "ارزیایی سیستم منابع آب با رویکرد یکپارچه بر اساس چارچوب حسابداری آب در محدوده مطالعاتی مشهد". مجله آب و فاضلاب, 27, 5, 1395, 3-16. یوسف زاده چابک, معصومه, باقری, علی, داوری, کامران. (1395). 'ارزیایی سیستم منابع آب با رویکرد یکپارچه بر اساس چارچوب حسابداری آب در محدوده مطالعاتی مشهد', مجله آب و فاضلاب, 27(5), pp. 3-16. یوسف زاده چابک, معصومه, باقری, علی, داوری, کامران. ارزیایی سیستم منابع آب با رویکرد یکپارچه بر اساس چارچوب حسابداری آب در محدوده مطالعاتی مشهد. مجله آب و فاضلاب, 1395; 27(5): 3-16. ارزیابی به‌عنوان یکی از گام‌های اساسی مدیریت یکپارچه منابع آب از مهم‌ترین مراحل برنامه‌ریزی و اجرای آن است. در این راستا، نظام حسابداری آب به‌عنوان ابزاری برای سازماندهی و ترکیب داده‌های گردآوری شده از منابع مختلف به‌منظور تدوین یک سیستم اطلاعاتی و فراهم آوردن امکان ارزیابی یکپارچه سیستم‌های منابع آب از طریق پیوند بین داده‌های فیزیکی و اقتصادی معرفی می‌شود. منطقه مورد مطالعه، محدوده مطالعاتی مشهد بود. با توجه به چارچوب پیشنهادی سازمان ملل، پس از تدوین حساب‌های آب مربوط به‌منطقه، متناظر با سال‌های1380 و 1385، با استخراج نشانگرهایی به تحلیل وضعیت منابع آب پرداخته شد. در نهایت با در نظر گرفتن گزینه‌هایی بر اساس مدارک موجود و اسناد توسعه بر اساس مدل تحلیلی سیستم دینامیک در محیط SIMULINK به ارزیابی نهایی منطقه پرداخته شد. نتایج حاصل نشان داد که اگر ارزیابی بر مبنای مقیاس منطقه‌ای (و نه مزرعه) صورت گیرد با اعمال اصلاحات در مدیریت عرضه و تقاضا (به‌ویژه اصلاح مصارف آب در کاربری‌های مختلف بخصوص کشاورزی و بازتخصیص سهم آب بین بخش‌های مختلف) می‌توان میزان افت آبخوان و همچنین تولید ناخالص داخلی را در منطقه بهبود بخشید. برای نمونه می‌توان با عدم اختصاص آب به بخشی از محصولات پرمصرف کشاورزی و تخصیص آن به خدمات، به‌ترتیب 2115 و 5690 ریال در هر مترمکعب در بهره‌وری منطقه در سال‌های 85 و 80 بهبود به‌دست آورد. Assessment is both a fundamental step in integrated water resources management and one of the most important stages in planning and implementing such management systems. Water accounting is regarded as a tool for organizing and combining the data collected from various sources to develop an information system that will provide a tool for the integrated assessment of water resources by combining relevant physical and economic data. Based on these observations, the present study was designed to analyze the present status of water resources in Mashhad Plain as the study area. For this purpose, the framework proposed by the UN was adopted and water accounts of the study region were compiled for the years 2001 and 2006 to extract the relevant assessment indicators. In a second stage, the policy options emerging from the available documents and regional development plans were examined and a final evaluation of the water use policies in the study area was conducted using an analytical system dynamics model in SIMULINK. Results indicate that not only can the present local acquifer declines be reduced but significant improvements can also be made in the gross productivity rate across the region by correcting and updating the present water allocation policies (especially by correcting agricultural water uses and reallocating water to other sectors) provided that assessments are based on a regional rather than a farm scale. For instance, if allocation to high water consuming crops such as tomato and sugar beets or livestock is stopped to reallocate part of the water saved to the service industry, the regional water productivity will be enhanced by 5690 and 2115 IRR per cubic meter for the years 2006 and 2001, respectively. 2. United Nations Statistics Division. (2012). System of environmental-economic accounting for water, UNSD Pub., N.Y.
3. Chalmers, K.., Godfrey, J., and Potter, B. (2012). “Discipline-informed approaches to water accounting.” Australian Accounting Review, 22, 275-285. 4. Hoekstra, A. Y., and Chapagain, A. K. (2007). “Water footprints of nations: Water use by people as a function of their consumption pattern.” Water Resour Manage, 21, 35-48. 5. Molden, D. (1997). Accounting for water use and productivity, International Irrigation Management Institute, Colombo, Sri Lanka. 6. WWAP., and UNSD. (2011). Monitoring framework for water, A Joint Publication of UN World Water Assessment Program (WWAP) and United Nations Statistics Division (UNSD), N.Y.
7. Vardon, M. (2010). “Preparation of the "Glossy" publication on the system of environmental-economic accounting for water.” 16th Meeting of the London Group on Environmental Accounting, Santiago. 8. Vardon, M., Lenzen, M., Peevor, S., and Creaser, M. (2007). “Water accounting in Australia.” Ecological Economics, 61, 650-659. 9. Pink, B. (2010). Water account Australia 2008-09, Australian Bureau of Statistics. 10. Project Consultant Egis Bceom International. (2010). “SADC Economic Accounting of Water Use Project.” European Development Fund, SADC. 11. Soulard, F. (2003). “Water accounting at statistics Canada: The inland fresh water assets account.” Paper Produced for the London Group of Environmental Accounting, Rome. 12. Karimov, A., Molden, D., Khamzina, T., Platonov, A., and Ivanov, Yn. (2012). “Awater accounting procedure to determine the water savings potential of the Fergana Valley.” Agricultural Water Management, 108, 61-72.